It's very common for indie game developers to deliver elevator pitches by referencing other games, particularly beloved retro titles. "Our game is like Mega Man," they might say. Or "our game is like Castlevania." 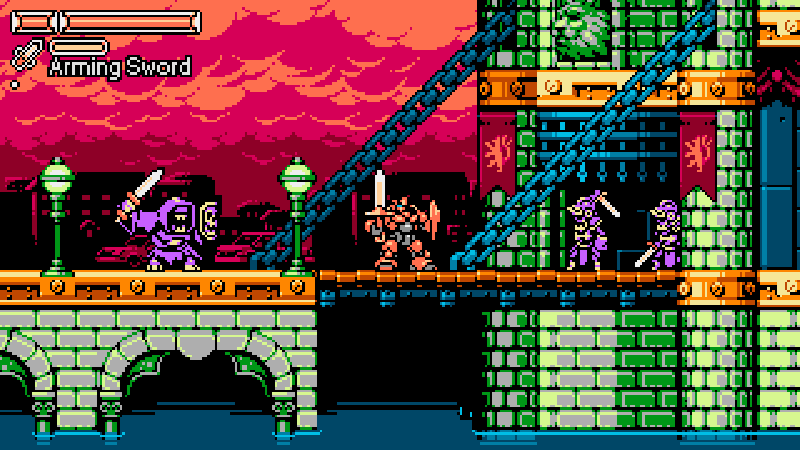 Tribute Games pitched its upcoming action-platformer Panzer Paladin as both those games to me—and then named several more 8-bit classics, including Sunsoft's Blaster Master and the not-technically-8-bit-but-close-enough Shovel Knight. Indeed, there's so much "retro love" going on in Panzer Paladin that I was initially worried there'd be no room left for its own voice, its own creative expression. Interestingly, something about the way Panzer Paladin picks and chooses mechanics from so many old games made the demo I played at PAX East feel unique. I guess it's a bit like how Mr. Burns from The Simpsons carries so many deadly diseases that there's no room for any of them to manifest fully, so he enjoys good health as a result. It might also help that Panzer Paladin doesn't hesitate to take inspiration from the "black sheep" of beloved 8-bit series. Justin Cyr, one of Tribute Games' founders, named some of these oft-criticized games as he walked me through my session. Two notable titles are Castlevania 2: Simon's Quest and Zelda 2: The Adventure of Link. The latter's influence is clear in the upward- and- downward-stab attacks you can perform while you're riding your titular Panzer armor (you can eject from the armor at any time to fight as a lither but less-powerful warrior. There's that Blaster Master shout-out). I also fought a heavily-armored enemy who attacks and defends much like an Ironknuckle from Zelda 2. If you've ever tried to break through one of those metallic bastards' shields, you know exactly what I mean. It's intriguing to see how Panzer Paladin takes inspiration from lesser-loved entries in long-lived series. Castlevania 2 and Zelda 2 are huge risk-takers, and while some of their design decisions miss the mark, their differences still make them special in an industry that generally favors "safe" ideas. Zelda 2 takes us to the far northern reaches of Hyrule, a place we haven't explored since. Castlevania 2 favors narrative and adventure over tricky platforming, and its "slower" pace inspired Koji Igarashi to pitch Castlevania: Symphony of the Night to Konami. Good things come from strange ideas, and Panzer Paladin might offer us another example when it comes out in spring 2020. The demo I played was short, and there's a long way for Tribute Games to go, but if it remembers what makes black sheep games so interesting while refining said games' oft-clumsy mechanics, we're in for a cool ride next year. Tagged with Action Adventure,	Opinions,	PAX East 2019,	PC,	Platformer,	tribute games.